Why is feedback important and how do you give feedback on writing? In this post you will find information about feedback, self- assessment and peer feedback, ideas on how to correct as well as a few suggestions on how to avoid burnout. The objective of feedback is to help the learner improve his/her performance (Ur, 2004) and give appropriate praise and suggestions (Harmer, 2013). When we talk about feedback on writing we need to consider the difference between assessment and correction. Assessment: the learner is informed about how s/he performed. Correction: some specific information is provided on aspects of the learner’s performance (Ur, 2004). Assessment is when we give a grade (A, B, C…) and it can be quite subjective. You can have assessment without correction, but you cannot have correction without some sort of assessment. What else do we need to consider when giving feedback on writing? The first thing we need to consider, in my opinion, is whether this feedback is an intervention (something we do during the writing process) or if it is feedback on the final product. We also need to think about who our learner is and why the learner is writing. Also, will you be correcting a full text or a sample of the learner’s writing. If you will be correcting a sample, who decides on what to correct? The teacher? Or will the learner ask the teacher to correct something particular? Other things you should think about is the class size and how much time you have to correct a particular piece of writing. Many teachers use an error code when checking students’ writing. You collect your students’ texts and instead of correcting the mistakes, you use symbols/abbreviations which correspond to language features, you use an error code. So, for example SP. stands for spelling and WW. stands for wrong word. You can make the error code yourself or use something you have found in a book. Instead of using abbreviations, you can use a highlighter pen. In this case, each colour corresponds to a type of error. This may be more suitable for children. Either way, you need to make sure that your students are familiar with the error code and know what each initial or abbreviation means. Try an error code terminology checker task. 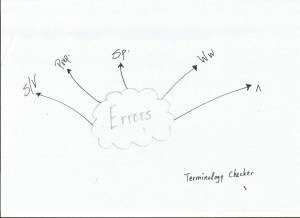 What is a terminology checker? Well, you write down the key abbreviations in bubbles and definitions under the bubbles, you then project them on the overhead projector or you use handouts. Your students then have to match the abbreviation with the definition or tell you what means what. One last thing you need to take into consideration is when to use an error code. Use it on mistakes the learners can correct. If you have a beginners class and you use the error code on, let’s say a verb that should have been in the passive voice, your learner will probably be unable to correct it, so you will only frustrate him/her or make him/her feel bad. When correcting your learner’s text it is a good idea to ask questions related to some of the information you find in the text, especially comments related to the content or lexis/grammar. Something may require more analysis, so you can make a comment bubble and ask, ‘What do you mean?’ or you may want to make a comment on something that you find interesting and say, ‘Great idea!’ or ‘I totally agree’. Apart from comments in the margins you may want to make comments at the end of a text as well. Make sure the comments in the margins are connected to the comments at the end. Also, make sure that your students understand the connection. 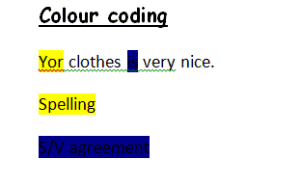 For example, if in the margin you say, ‘What do you mean by this?’ and in your final comments (at the bottom of the page) you say, ‘You need to support your arguments more’, make sure that your learners understand that these two comments are connected. Reformulation is when you rewrite the learner’s original text in a better way. Keep in mind that reformulation is a great way for the learners to see how they can produce a better text, just make sure that your ‘better version’ is not beyond the learners’ abilities. Your students probably like technology, and these websites have some really useful tools. Another benefit of using online feedback is that they get saved in the web so the dog cannot chew up your feedback!! It takes time to get used to and you or your students may not like technology. Write nothing. Instead of writing comments, have a tutorial with your learner. Have a short meeting where you discuss the strengths and weaknesses of the learner’s writing. Your learner will be able to ask questions and even open up to you about any difficulties regarding his/her writing. Individual feedback is quite clear from its name. You comment on the individual’s writing. Group feedback is when you give feedback on the whole group’s writing. You focus on common features of performance and how these can be improved. Make a check list and ask your students to assess their work based on the items in this check list. Your students can assess their performance in a writing journal. They can reflect on what they have managed so far and write down anything that makes them worry. They can even use the sandwich feedback method to assess their texts. Your learner will realise that he/she needs to address it. You, the teacher, can include tasks, lessons that will help your learners with structures and language they are struggling with. 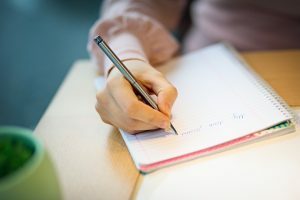 Instead of you marking your students’ work based on writing assessment criteria, why not get them to look at their work and assess it based on the writing assessment criteria? These type of activities are remarkable when working with advanced learners. It gets your students to reflect on their texts and see what needs work on. I have used criteria sheets in my exam classes and my EAP classes. I strongly recommend you try this with your learners. I would not recommend it for lower level students though because they may have language barrier issues. 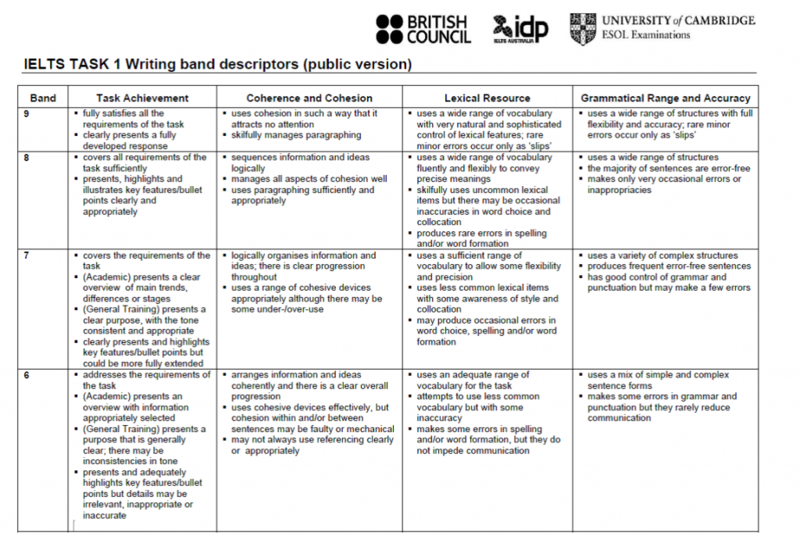 When you first introduce writing assessment criteria to your learners, it is a good idea to use a sample. Give them a text that has been assessed based on writing criteria but do not give them the final grades. Ask them to assess it and then show them the grades/highlighted criteria. Once they familiarise themselves with the process, they will be able to apply it to their own work. Design a form and get your learners to check their classmates work based on what is on the form. You can also make reading circles. How does this work? Get your learners into groups of four and ask them to look at each other’s work and make comments, ask questions and use rubrics to assess their classmate’s writing. This way, each learner will get feedback from three people! Emphasise to your learners that they should only correct things they are sure their classmate has wrong. Your role here is to monitor and offer suggestions when asked. How do you know your learner understands your feedback? We all give feedback and most of the times are probably happy with the work we have done. The question to ask though is, ‘How do we know that our learners are learning from our feedback?’ Well, you can do two things. Get feedback on your feedback. Ask your learners what they think of the feedback you give them. Do they find it helpful? Is it enough? You could also make this feedback anonymous and get your students to tick boxes. A while back I had written a post about feedback Q & A. What you do is after you correct your student’s writing, you make comments and then based on these comments you ask questions and give them tasks to practice any structures, grammar points etc. they used incorrectly. This takes a lot of time and cannot be done with big classes (unless it is group feedback) and on a daily basis. I do recommend trying it from time to time though. Feedback on writing is very important and integral to our learners’ progress. I hope you found this post helpful. Joanna Malefaki has been teaching English for about 20 years. She is a Language and Study Skills Tutor at the University of York’s International Pathway College. She has an M.Ed in TESOL and the Cambridge Delta. This post was originally published on her own blog www.myeltrambles.com. Harmer, J. (2013) The Practice of English Language Teaching. China: Pearson. Richards, C. J. & Schmidt, R. (2010) Longman Dictionary of Language Teaching & Applied Linguistics. Malaysia: Pearson. Ur, P. (2004) A Course in Language Teaching. Cambridge: CUP.